Termites tend to eat through the wood, leaving small tubes inside that are known as feeding galleries. Because they don’t readily appear on the surface, it may be difficult for you to identify a termite infestation. That is one of the main reasons why you need to call in a professional pest management company at least once a year to thoroughly inspect your house. 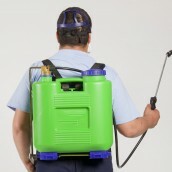 If there is an infestation, the company will discover and treat it immediately. Regular inspections are necessary if you want to effectively mitigate the risk of a termite infestation. This is one of the best things that you can do for proper termite control. One of the best termite control tips that you should keep in mind is to remove all wood to soil contact. Try to cover all of the soil in the crawl spaces with a plastic sheet, and if any wooden furniture or structural element is in direct contact with the soil, try to place a sheet in between them in order to cut off contact. Foam boards and wood siding should ideally be kept at a distance of at least six inches from the ground in order to mitigate the risk of a termite infestation. You should also consider getting all leaky gutters and roofs fixed.